While a trimmer is important tool in every scrapbooker's set of supplies for making straight cuts on a larger scale, it's very helpful to have a small and sharp pair of scissors for more precision cuts. Olfa is known for high quality cutting products and their new scissor design - the 5-inch Precision Appliqué Scissor - is no exception. 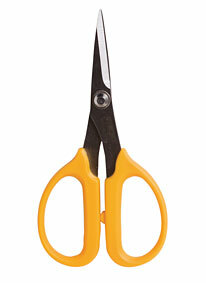 These scissors were designed specifically for working with fabrics and can accurately cut up to six layers of fabric. Many scrapbookers have been incorporating various types of fabric, trim and stitching into their designs for quite some time, so it only makes sense to add this great pair of scissors to your stash of tools. They are lightweight, feature stainless steel blades and have wider holes that accommodate up to three fingers for comfort and more control in cutting. Here's a chance for you to try them out for yourself!! Simply leave a comment to this post by 5 p.m. on Thursday, December 15th, 2011 and you'll be entered to win.